Zoysia is an excellent choice if you need a sod that can thrive in high-traffic areas. As Zoysia grows, it develops a dense carpet of grass that spreads above ground in stems called stolons and underground in stems called rhizomes. This thick, dense growth makes it possible to play lawn games and entertain on your Zoysia sod without causing lasting damage. This fine-textured grass grows in a beautiful emerald green color that is sure to help your lawn look rejuvenated and healthy. It retains this light to medium green color during its active growing season, then turns brown when winter dormancy begins. Although Zoysia does turn brown temporarily, its green season is much longer than that of Bermudagrass and other warm-season sods. Zoysia grasses are also among the first to return to their green hues in the spring. Thanks to its deep root system, Zoysia can efficiently conserve moisture throughout the year. This gives the sod drought resistant properties that are valuable during Florida’s inevitable dry spells. Zoysia can remain green during short droughts. During longer droughts, Zoysia protects itself by going dormant and turning brown, yet can quickly return to its green color when watered consistently. Finally, though Zoysia prefers full sun, it can tolerate light shade. If you think that Zoysia might be the perfect sod for your yard, call (813) 684-7336 to speak to an expert at Green Solutions Lawn Care and Pest Control in Tampa, Florida. 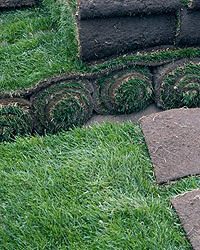 The owners of Green Solutions are formal experts in grass management, so they offer unique insight and knowledge to properly match your lawn with the best variety of sod. Share the post "3 Reasons Zoysia Sod is the Right Choice for Your Florida Lawn"